The Panama Canal (Spanish: Canal de Panamá) is a major ship canal that traverses the Isthmus of Panama in Central America, connecting the Atlantic and Pacific Oceans. Construction of the canal was one of the largest and most difficult engineering projects ever undertaken. It has had an enormous impact on shipping between the Pacific and Atlantic oceans, obviating the long and treacherous route via the Drake Passage and Cape Horn at the southernmost tip of South America. A ship sailing from New York to San Francisco via the canal travels six thousand miles, well under half the distance of the previous 14,000-mile route around Cape Horn. After a French attempt to construct the canal failed, construction was completed by the United States, and the canal opened in 1914. The building of the 48-mile canal was plagued by problems, including disease (particularly malaria and yellow fever) and landslides. Thousands died during construction of the canal. 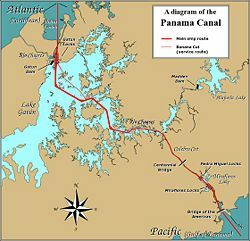 In 1999 the United States handed over the canal to the Panamanian government, who had previously assigned the operation of the strategic waterway to a Chinese company. A typical passage through the canal by a cargo ship takes around nine hours. In 2005, 14,011 vessels passed through the canal, with a total capacity of 278.8 million tons, making an average of almost 40 vessels per day. The earliest mention of a canal across the isthmus of Central America dates back to 1534, when Charles V, Holy Roman Emperor and king of Spain, suggested that a canal in Panama would ease the voyage for ships traveling to and from Ecuador and Peru. Given the strategic position of Central America as a narrow land dividing two great oceans, other forms of trade links were attempted over the years. The ill-fated Darien scheme was an attempt launched by the Kingdom of Scotland in 1698 to set up an overland trade route, but was defeated by the generally inhospitable conditions, and abandoned in 1700. Finally, the Panama Railway was built across the isthmus, opening in 1855. This overland link greatly facilitated trade, and this vital piece of infrastructure was a key factor in the selection of the later canal route. An all-water route between the oceans was still seen as the ideal solution, and the idea of a canal was revived at various times, and for various routes; a route through Nicaragua was investigated several times. Finally, enthused by the success of the Suez Canal, the French, under Ferdinand de Lesseps, began construction on a sea-level canal (without locks) on January 1, 1880. In 1893, after a great deal of work, the French scheme was abandoned due to disease and the sheer difficulty of building a sea-level canal, as well as lack of French field experience. The high death toll was one of the major factors in the failure. Although no detailed records were kept, as many as 22,000 workers are estimated to have died during the main period of French construction (1881–1889). The United States, under Theodore Roosevelt, bought the French equipment and excavations and began work in 1904 after helping Panama to declare independence from Colombia in exchange for control of the Panama Canal Zone. A significant investment was made in eliminating disease from the area, particularly yellow fever and malaria, the causes of which had recently been discovered. With the diseases under control, and after significant work on preparing the infrastructure, construction of an elevated canal with locks began in earnest. The canal was formally opened on August 15, 1914, with the transit of the cargo ship Ancon. Advances in hygiene resulted in a relatively low death toll during the American construction; still, 5,609 workers died during this period (1904–1914). This brought the total death toll for the construction of the canal to around 27,500. By the 1930s it was seen that water supply would be an issue for the canal; this prompted the building of the Madden Dam across the Chagres River above Gatún Lake. The dam, completed in 1935, created Alajuela Lake, which acts as additional water storage for the canal. In 1939 construction began on a further major improvement: a new set of locks for the canal, large enough to carry the larger warships which the U.S. had under construction. The work proceeded for several years, and significant excavation was carried out on the new approach channels; but the project was canceled after World War II. After the war, United States control of the canal and the Canal Zone surrounding it became contentious as relations between Panama and the U.S. became increasingly tense. Many Panamanians felt that the Canal Zone rightfully belonged to Panama; student protests were met by the fencing in of the zone and an increased military presence. Negotiations toward a new settlement began in 1974, and resulted in the Torrijos-Carter Treaties. Signed by President Jimmy Carter and Omar Torrijos of Panama on September 7, 1977, this set in motion the process of handing the canal over to Panamanian control without charge. Though controversial within the U.S., the treaty led to full Panamanian control effective at noon on December 31, 1999, and control of the canal was handed over to the Panama Canal Authority (ACP). Before this handover, the government of Panama held an international bid to negotiate a 25-year contract for operation of the canal's container shipping ports (chiefly two facilities at the Atlantic and Pacific outlets), which was won by the Chinese firm Hutchison Whampoa, a Hong Kong-based shipping concern whose owner, Li Ka Shing, is considered the wealthiest man in Asia (see Geopolitical Controversy, below). Public concern over the possibility of the Chinese taking over operation of the Panama Canal rose sharply after the handover to the Panamanian government on December 31, 1999, when a subsidiary of the Hong Kong-based firm, Hutchison Whampoa Ltd., began running port facilities at both ends of the strategic waterway. U.S. intelligence officials say the company's owner, Li Ka-shing, has close ties to Chinese leaders in Beijing and that the facilities could be used by China to disrupt military shipments to Asia in a future conflict between the United States and China over Taiwan. Since opening, the canal has been enormously successful, and continues to be a key conduit for international shipping. Each year more than 14,000 ships, carrying more than 203 million tons of cargo pass through the canal. By 2002, about 800,000 ships had passed through the canal. The maximum size of vessel which can use the canal is known as Panamax; an increasing number of modern ships exceed this limit, and are known as post-Panamax vessels. The canal is presently handling more vessel traffic than had ever been envisioned by its builders. In 1934, it was estimated that the maximum capacity of the canal would be around 80 million tons per year; canal traffic in 2005 consisted of 278.8 million tons of shipping. Despite the gains which have been made in efficiency, the canal is soon expected to approach its maximum capacity. An additional complication is that the proportion of large (close to Panamax-sized) ships transiting is increasing steadily; this may result in a further reduction in the number of transits, even if cargo tonnage rises. In any case, if the canal is to continue to serve the needs of world shipping, action will be required to increase its capacity. More than ninety years since its opening, the canal continues to enjoy great success. Even though world shipping—and the size and design of ships themselves—have changed beyond recognition since the canal was designed, it continues to be a vital link in world trade, carrying more cargo than ever before, with less overhead. Nevertheless, the canal faces a number of potential problems. 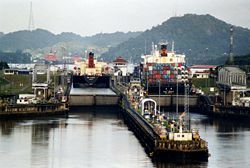 There were fears that efficiency and maintenance would suffer following the U.S. withdrawal; however, this does not appear to be the case, and the canal's efficiency appears to be improving under Panamanian control. Canal Waters Time (CWT), the average time it takes a vessel to navigate the canal, including waiting time, is decreasing. At the same time, the rate of accidents is at a record low. The canal administration has invested nearly U.S.$1 billion in widening and modernizing the canal, with the aim of increasing capacity by 20 percent. The canal authority cites a number of major improvements, including the widening and straightening of the Gaillard Cut to reduce restrictions on crossing vessels, the deepening of the navigational channel in Gatún Lake to reduce draft restrictions and improve water supply, and the deepening of the Atlantic and Pacific entrances of the canal. This is supported by new vessels, such as a new drill barge and suction dredger, and an increase of the tugboat fleet by 20 percent. In addition, improvements have been made to the operating machinery of the canal, including an increased and improved tug locomotive fleet, the replacement of more than 9.3 miles of locomotive track, and new lock machinery controls. Improvements have been made to the traffic management system to allow more efficient control over ships in the canal. 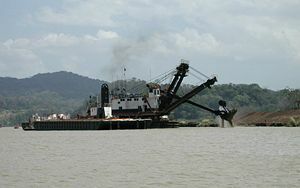 The withdrawal of the U.S. has allowed Panama to sell excess electricity produced by the canal's dams, which was previously prohibited by the U.S. government. Only 25 percent of the hydroelectric power produced in the canal system is required to run the canal. Despite having enjoyed a privileged position for many years, the canal is increasingly facing competition from other quarters. Although remote, speculation continues over a possible new canal through Mexico, Colombia or Nicaragua that will be capable of accommodating post-Panamax vessels, and two private proposals for a railway linking ports on the two coasts. Critics have also voiced their concerns over the planned increase in canal tolls, suggesting that the Suez Canal may become a viable alternative for cargo en route from Asia to the U.S. East Coast. Nevertheless, demand for the Panama Canal continues to rise. The increasing rate of melting of ice in the Arctic Ocean has led to speculation that the Northwest Passage may become viable for commercial shipping at some point in the future. This route would save 5,800 miles on the route from Asia to Europe compared with the Panama Canal, possibly leading to a diversion of some traffic to that route. However, such a route would still hold significant problems due to ice, as well as unresolved territorial issues. A significant problem is the decreasing average amount of water in Gatún Lake, caused largely by deforestation. Fifty-two million gallons of fresh water from the lake are drained into the sea by the locks every time a ship transits the canal, and although there is sufficient annual rainfall to replenish the water used by the canal in a year, the seasonal nature of this rainfall means that the water must be stored from one rainy season to the next. Although Gatún Lake can store some of this water, the rainforest has traditionally played a major role by absorbing this rain, and then releasing it at a steady rate into the lake. With the reduction in vegetation, rain flows quickly down the deforested slopes into the lake, from where the excess is spilled out into the ocean. This results in a shortfall of water during the dry season, when there is comparatively little water flowing to the lake to replenish it. Deforestation also causes silt to be more easily eroded from the area around Gatún Lake and collect at its bottom, reducing its capacity. With demand rising, the Panama Canal is positioned to be a significant feature of world shipping for the foreseeable future. However, changes in shipping patterns—particularly the increasing numbers of post-Panamax ships—will necessitate changes to the canal if it is to retain a significant market share. It is anticipated that by 2011, 37 percent of the world's container ships will be too large for the present canal, and hence a failure to expand would result in a significant loss of market share. The maximum sustainable capacity of the present canal, given some relatively minor improvement work, is estimated at between 330 and 340 million PC/UMS tons per year; it is anticipated that this capacity will be reached between 2009 and 2012. Close to 50 percent of transiting vessels are already using the full width of the locks. 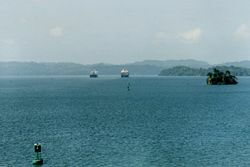 This proposal to expand the canal was approved in a Panamanian national referendum by approximately 80 percent on October 22, 2006. The new locks will be supported by new approach channels, including a 3.8-mile-long channel at Miraflores from the locks to the Gaillard Cut, skirting around Miraflores Lake. Each of these channels will be 715 feet wide, which will require post-Panamax vessels to navigate the channels in one direction at a time. The Gaillard Cut and the channel through Gatún Lake will be widened to no less than 918 feet on the straight portions and no less than 1,200 feet on the bends. The maximum level of Gatún Lake will be raised from reference height 87.5 feet to 89 feet. Each flight of locks will be accompanied by nine water reutilization basins (three per lock chamber), each basin being approximately 230 feet wide, 1,410 feet long, and 18 feet deep. These gravity-fed basins will allow 60 percent of the water used in each transit to be reused; the new locks will consequently use seven percent less water per transit than each of the existing lock lanes. The deepening of Gatún Lake, and the raising of its maximum water level, will also provide significant extra water storage capacity. These measures are intended to allow the expanded canal to operate without the construction of new reservoirs. The estimated cost of the project is $5.25 billion. The project is designed to allow for an anticipated growth in traffic from 280 million PC/UMS tons in 2005 to nearly 510 million PC/UMS tons in 2025; the expanded canal will have a maximum sustainable capacity of approximately 600 million PC/UMS tons per year. Tolls will continue to be calculated based on vessel tonnage, and will not depend on the locks used. 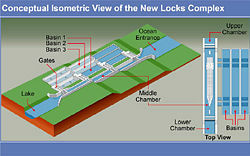 The new locks are expected to open for traffic in 2015. The present locks, which will be one hundred years old by that time, will then have greater access for maintenance, and are projected to continue operating indefinitely. ↑ The Americans in Panama by William R. Scott, Statler Publishing Company, New York, 1913. ↑ Panama Canal History - The French Canal Construction. 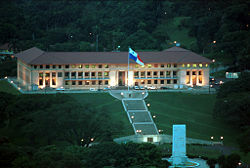 Panama Canal Authority. Retrieved May 30, 2007. 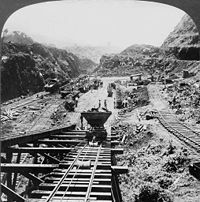 ↑ Panama Canal History - American Canal Construction. Panama Canal Authority. Retrieved May 30, 2007. ↑ Panama Canal History – End of the Construction. Panama Canal Authority. Retrieved May 30, 2007. ↑ Historical Map & Chart Project – National Oceanic and Atmospheric Administration (NOAA). Retrieved May 30, 2007. ↑ The Land Divided - A History of the Panama Canal and Other Isthmian Canal Projects by Gerstle Mack, 1944. Retrieved May 30, 2007. ↑ Bob Cullen, “A Man, A Plan, A Canal: Panama Rises.” Smithsonian Magazine (March 2004). Retrieved May 30, 2007. ↑ Steve Nettleton, “Transfer heavy on symbolism, light on change.” CNN Interactive. Retrieved May 30, 2007. ↑ Modernization & Improvements. Panama Canal Authority. Retrieved May 30, 2007. ↑ Sevunts, Levon. “Northwest Passage redux.” The Washington Times (June 12, 2005). Retrieved May 30, 2007. ↑ “Relevant Information on the Third Set of Locks Project.” Panama Canal Authority. April 24, 2006. Retrieved May 30, 2007. ↑ Associated Press. “Panama approves $5.25 billion canal expansion.” MSNBC.com. October 22, 2006. Retrieved May 30, 2007. Cullen, Bob. “A Man, A Plan, A Canal: Panama Rises.” Smithsonian Magazine, March 2004. This page was last modified on 11 January 2019, at 19:55.